Last week was my last week of vacation. I flew to Estonia to celebrate my borther's and Mum's birthdays the weekend before and took the ferry back on Monday with Mum. We shopped, visited Fjärilshuset, shopped, had lunches in various cafés and, in general, had a good time. 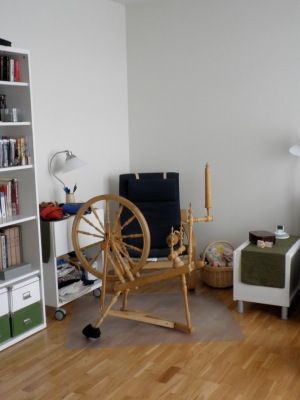 When we were not out and about, I was spinning or knitting in my crafting corner. Since I don't live in my flat any longer, and the iMac is not there anymore, I could rearrange that corner a bit. Marvelous! It is so nice to sit, rock and spin there while listening audio-books. 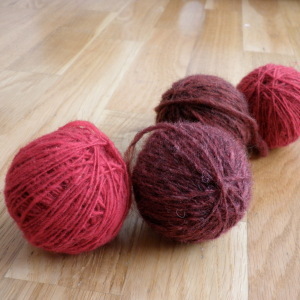 I'd bought some red pre-yarn in Estonia and spun that up in no time. Wheel spinning is so much faster than spindling. The yarn is space dyed in different reds. I am planning to ply it with black. Again. I just need to buy some black pre-yarn and protect it from cats better this time.